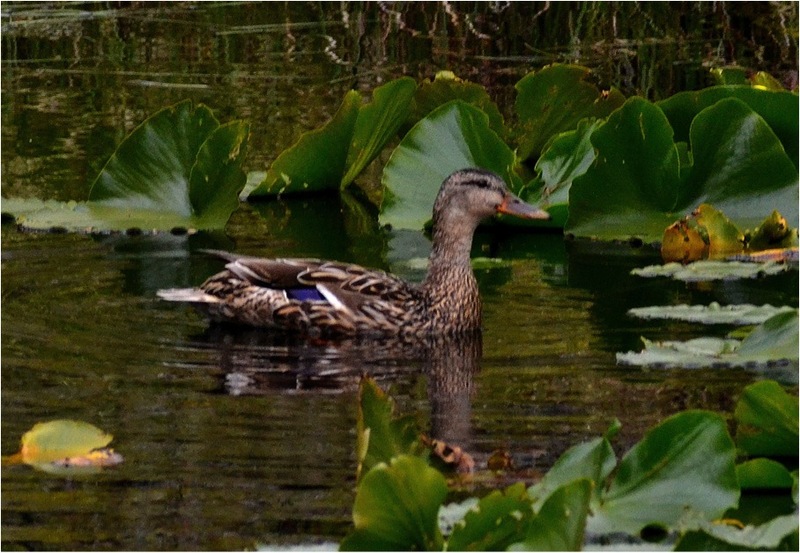 Left: female mallard photographed by Christian Kelly. 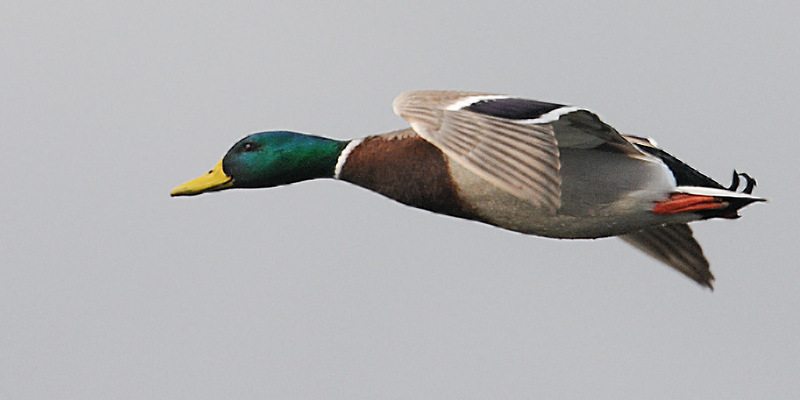 Right: male mallard by Mike Yip. The mallard is the most familiar and common duck species in many places in the northern hemisphere. Male mallard plumage is particularly distinctive with a metallic green head and neck, yellow bill, white neck band, grey sides, and curling black tail feathers. The female has dull brown plumage, and is distinguished from similar-looking species by its orange bill with black markings. Both the male and the female has bright metallic blue wing speculum patches bordered with white. These bright flashes of colour are visible during flight and when the wings are folded. The male may be flashier in colouring, but it is the female who makes the classic "quack quack" call. The male makes a variety of other sounds for defence, courtship, and other communication. This species can live in and around both man-made and natural wetland habitats. It is commonly seen around ponds, lakes, streams, fountains, and parks. Mallards are often very used to humans, and can be found in urban and suburban settings. The mallard is found year-round on the coast of BC. This year-round range is mostly in the northern United States, though it extends up north along the coast of Alaska and into the southern portions of Alberta and Saskatchewan, and south into central Mexico. The mallard's summer breeding range covers most of Canada; it then migrates south to the southern US and Mexico for winter. This species is also found throughout the northern hemisphere in subtropical and temperate areas including Britain, Iceland, and Scandinavia. It is the most common duck in Britain. The northern shoveler has similar colouring to the mallard, but can be distinguished by its much longer and wider bill; additionally, the male northern shoveler bill is black. The female gadwall looks similar to the female mallard, but with some slight differences: its bill is slimmer and is black with a thin orange line along the edge. It also has a white wing patch instead of blue edged in white. Mallards are "dabbling ducks," so called because of their feeding habit of tipping forward, tail in the air, while they graze on underwater plants and algae. They often hybridize with other duck species. Nearly all domestic ducks arose from mallards; often domestic ducks appear in urban areas, but can look much different than mallards and can be hard to identify. Read other interesting facts on the All About Birds Mallard page. Dunn, J. L. and Alderfer, J. (Eds.). (1999). National Geographic Field Guide to the Birds of North America. (3rd Ed.). Washington, D.C.: National Geographic Society. Pp. 76-77. Mallard. The Birds of North America Online (A. Poole, Ed.). Ithaca: Cornell Lab of Ornithology. Retrieved from the Birds of North America Online. Accessed 23/07/2013. Mallard (Anas platyrhynchos). ARKive.org. Accessed 23/07/2013.